January 2019 update: a new recipe, egg-free, simpler and faster, is on the way! 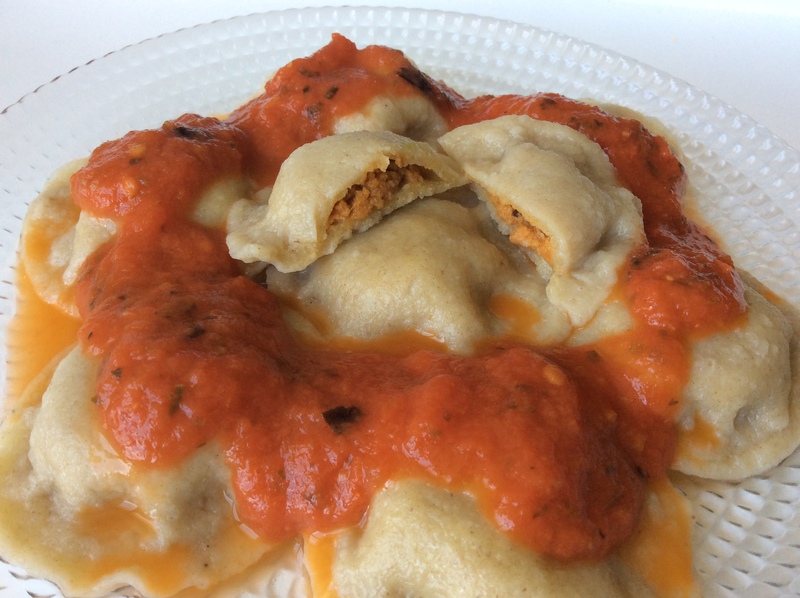 Did you know that you can make your own gluten-free ravioli? Well, for the longest time I didn’t, until I found a recipe for it on a French site (here). I tested it with various flour mixes until it finally fit my taste buds. I then worked out two different fillings, one vegan (my preference) and one meat-based (Hubby’s). This recipe is easy but a little time consuming. However, the ravioli need to be frozen before cooking; so do not hesitate to double the quantities, as I do! It will prove very convenient food to have in your freezer for the coming month of September, usually a busy time for many people! 1. Mix the dry ingredients, make a well in the center, add the egg yolk and water. Start making the pasta dough by pinching the flour with your fingers into the wet ingredients, then by grabbing whole handfuls of the dough. Don’t worry if at this point it feels sticky. Depending on the quality of the flour and the size of your egg yolk you make need to add a little more water. Do so 1 tsp at a time, until the dough feels fairly supple. 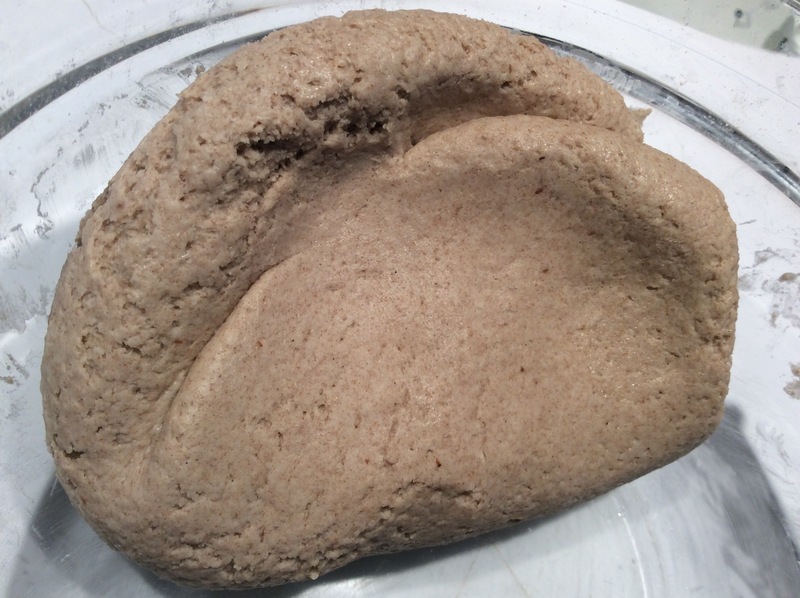 This is what the dough should look like when you fold it; as you can see, this photo was added as an update when I used a darker teff flour and had to add more water. 2. Scrape your fingers clean of the sticky stuff (I use a plastic spatula), then knead the dough for a few minutes, pressing it with the palm of your hand between folds. (Hope I am clear ^^) I just love these little gymnastics, it is so unusual to be able to knead a gluten-free dough! 3. Form a ball, wrap in plastic and let sit in the fridge. This will be the time to make the filling of your choice if you haven’t already done so: vegan (with a garbanzo bean paste) or more traditional, but also more time-consuming, meat-based. NOTE: I usually do steps 1 trough 3 the day before I proceed to the actual making of the ravioli. 4. Roll out the dough between an oiled sheet of parchment paper and plastic wrap. The rolled dough should be relatively thin. Cut out circles about 2 inches in diameter; if you don’t have a cookie cutter, a small cup will do just fine! 5. Transfer half of the disks (about 12) onto a LINED baking tray (this is super important, otherwise the ravioli will stick to the tray as they freeze and you may not be able to remove them without any damage– I am speaking of experience!!!). To transfer the disks you might want to lift their edges with the end of a knife before using your fingers. The particular mix of flours I use in this recipe (rice + teff + tapioca starch) is better than others in the sense that the dough won’t just come apart as you handle it. 6. Place a small teaspoonful of stuffing inside the disks, then cover with the remaining circles. Carefully seal each ravioli with your index fingers and freeze the tray: this will secure the sealing. When the dough has completely hardened, you can then remove all the ravioli from the lining and place them in a freezer bag (still in the freezer) until cooking time. 7. Cooking: drop the frozen ravioli inside a large amount of salted boiling water and let boil (not simmer) between 10 to 12 minutes, reducing the heat if you feel that the ravioli might come undone. Serve with the tomato sauce of your choice, preferably homemade, as always! Love you recipes, love your blogs (English and French!). I am glad I found you!